Does My Home Have Popcorn Ceilings? Popcorn, or stucco, ceilings refers to a type of texture that was hugely common in the 70s or 80s, so if your home was built in that era, there’s a high probability that you do. The texture is made up of small, jagged bumps all over the ceiling, hence the popcorn nickname. Originally it was added often times to add more soundproofing via another layer on the ceiling, as well as the fact it was great for hiding any imperfections rather than the ceiling needing to be perfectly smooth. Do I Need To Remove Them? This depends on several factors. 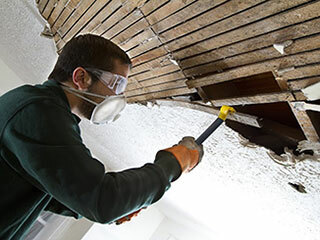 If you’re aware that your home was made in the 70s, popcorn ceilings were made with asbestos so your ceilings may be a health risk if this is the case. Aside from that, they’re certainly no longer the style of the era, and the overall look and beauty of your home will be soured by these out of date additions. This is of concern especially if you want to sell eventually, as they’re highly unpopular. Particularly due to the potential for dangerous materials, it’s very important to let the professionals handle removal. We’ll first test to ensure that there isn’t any asbestos present, and should there be, will take extra steps to prevent any risks to the health of those involved. Even without that danger, removal is a messy undertaking and can be very difficult if the ceiling has paint over it as well. We’ll use plastic to cover the area and clean up thoroughly after we’re finished. Water can dissolve unpainted texture for easy removal, but otherwise it will have to be dry-scraped. Afterward, filing will smooth out the substrate to then be primed and painted, thus leaving your ceilings sleek and far more aesthetically pleasing. There’s no reason to wait! Drywall Repair & Remodeling Beverly Hills is happy to assist you. Just contact our team today to find out more. You’ll be so glad that you did.